I’d like to second the praise for National Express East Coast. I wanted to pay using my Solo card, which TrainLine do not accept. Even though I was going from Tiverton in Devon to Elstree in Hertfordshire, I was able to book this journey via the NEEC website, pay using Solo, and pay no fees for booking or collection of the tickets etc. Fab all round. Spread the word people, if TrainLine start losing business they will be forced to reappraise their fees. Great comments on here and it looks to me like The Trainline’s rip-off dominance is at last disappearing. Just found a new service on Southern (www.southernrailway.com) which seems to use the same technology as National Express. 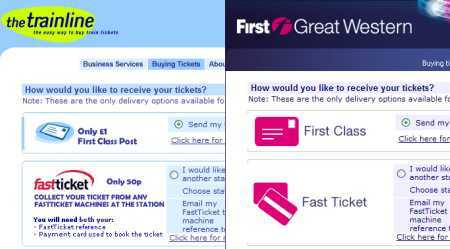 No fees and no hassle from The Trainline, and the system is far, far easier to use. I know where I’ll be buying my tickets from in future. I purchased a return ticket London-Aberdeen with trainline and booked an off-peak ticket leaving at 4pm. Not being familiar with the UK train system, I was not aware of the “off-peak” part and that 4pm falls within it. I was forced by the ticket collector to pay an additional £96. Now why then was I allowed to make such a booking online I will never understand. I had also booked a berth sleeper on my way back but when I arrived at the train learned that in fact, since I had not made a “reservation” I had not. The trainline website is apallingly misleading and misinforming and I cannot understand why it still exists! Well my problem with the trainline.com lies in the fact that I get charged TWICE for tickets. Some nice person at this shocking company TAKES MY DETAILS and tries to manually input the data into their system again, despite the booking going through A-OK on the website in the first place. Sounds like I am not alone, I booked a first class ticket with trainline and the failed to send the tickets, I accepted the £10 penalty for refund and bought a new ticket at the station. * We will ring you back to save phone charge, promised 5 times to date I have not had a single call from trainline. Please feel free to add to add to the list of automatic responses. Previous phone call 10 minutes ago on hold for another 25 minutes and guess what, I will have an email in 24 hours and a refund in 3 days. Having tried everything myself I am now elevating this matter to my company legal team, lets hope they have better luck. Forget the refund department, as it seems they only consider refunds to be for when you decide not to travel, not for when you’re claiming your money back because of their mistake. after watching a advert to order tickets from trainline to save money on the adverts, I decided to get in touch with these people as my daughter and I wanted to visit BOURNEMOUTH and return the same day, I spent ages at the computor getting the information wasnt given the price after ages was given two option 1. to go back wich obviousley didnt want to do that as I had already gone back numerous times to get the information and it was not coming up so I pressed the phone option thinking the information was going to be given on the mobile but alas no was given a code wich was then put in the info box with a charge of 25pence and the only info I was then given was what time the train was going the next day wich I already knew, nothing about the price so i then rang them after a pointless run through the methods again on the computor as if I hadnt a clue what to do, the lady i spoke to on the phone informed me that the price was exactly the amount I would of paid by walking into the station tomorrow, when I complained of the total waste of time not forgetting the 25pence for a useless text Maria Gregory at thetrainline.com informs me i should have booked a month in advance but the advert on telivision does not give that information neither did the information on thetrailine.com site and strangly enough it wasnt possible for me to write to them she just give me this e-mail address that does not give you access to write to them anyway so I expect weighing it all up it is all a total waste of time and effort just another con to rope people in and collect there money, the last words that she spoke was “would you like me to book these tickets for you anyway”I replied “no thats okay I will get them in the morning at the train staion”. thankyou. I booked tickets with them, and enetered a new delivery address as they had a few of my old ones and purchased. on my confirmation email they had an old address. SO i rang straight away, nothing they could do couldnt change my adress and i would only get a refund if my tickets were returned! a disgrace! DO NOT USE THE TRAINLINE EVER. Charging booking fee’s collection fee’s and credit card fee’s can not and WILL NOT be tolerated. checkout http://www.cheaptraintickets.info/cheap-train-tickets-guide/ some nice tips. My company has just spent in excess of £2,000 on rail tickets for a conference through the trainline.com. On checking these tickets I found the seat reservation numbers did not tally with the email confirmation, some tickets had the wrong dates, and some seat reservations were missing. ALL THE FAULT OF THE TRAINLINE!!!! I have telephoned them twice. The first time I gave all the details to a very nice man (off-shore) who promised me he would send me an email with details of how to get tickets changed and receive the missing seat reservations – no email. I called again and spoke to a lady (off-shore) who had not heard of the man I spoke to earlier, and on hearing I had 38 journeys on one reference number decided to leave me on hold listening to music for over 30 minutes. Needless to say I hung up. I have traced various Directors on the internet and they will be receiving a daming letter from me regarding their company’s service. I very much doubt that my company will be using their services again. I only hope they have not achieved Investors in People or some other accolade as everything about thetrainline.com is consistently bad. I booked tickets on TLine website paid by Visa Debit. 5 days later I tried to collect them from Westbury Stn but it would not accept my card and would not issue tickets. Went home and discovered that the bank had sent new cards for that account 2 days before and my wife had cut up the old cards (as you should). Phoned T Line (India) they didn’t want to know but said you will need to get more tickets.” But that means I will be paying twice ” but he told me if I showed them I was paying twice they would refund the unissued ticket cost. So again I booked on line and used a new debit card then went to the station and got the tickets. Then asked for a refund as told too but they don’t want to know and will not pay out as the T&C say no card , no tickets, so no refund. Crooks! I had often wondered what would happen if a card was cancelled: whether the ticket machine just reads the stripe on the card or if it needs to validate it with the bank’s database. The same thing could happen when collecting concert tickets ordered online by credit card (although the box office staff would probably be more helpful). As I see it, you had the card used to buy the tickets just as required. It doesn’t say the card still needs to be valid at time of collection. The card is being used for identification, not to make a payment. I suggest you write to customer services, explaining what happened, and providing printouts of receipts and any unused tickets. The address is above. As I said before, don’t bother with the refunds department, go straight to customer services. Never use TheTrainline.com – this is a common piece of advice, but there is a problem with it. They run the online ticket booking for many train operators, so while the advice to avoid their own website is correct insofar as avoiding their extortianate fees goes, all well and good. But if you book online using an operator website, then need customer service, you’re stuffed. They are not just a joke, they are borderline criminal IMHO. I booked tickets to travel on Virgin, and subsequently tried to claim a refund. I won’t go into details, but I’ve ow resorted to asking for a charge-back to my credit card from my bank, as it seems to be the only way of getting my money back. looks as if thetrainline is doing some kind of employment scam too . They have been advertizing the same job for a year on http://www.jobserve.co.uk . In this economic climate they would have plenty of applicants , including me , several times . No feed back though . Work this one out then. I bought two return tickets from The Trainline.com totalling £184. When I collected the tickets from the machine on the day I was charged another £52 by SouthWest Trains! According to my bank – who I made a claim with as I was (and still am) sure this extra charge can’t be right – everything is in order. I’ll be queuing up at the ticket office next time. @Rob, that sounds very odd, and seems more likely to be a fault with the ticket machine than TheTrainline in this instance. What did you get out of the machine? Presumably your tickets and a collection receipt, which usually both have the price on them. Is this £52 mentioned? What is it supposedly for? If it was a credit card, your bank should refund it. Otherwise, try writing to South West Trains and ask them what this charge was for (ask for the record under the Data Protection Act if necessary). They may just say it was a mistake and refund you. If you press the “collection” button on a ticket machine, the owner of the machine should never charge you anything. Your card should only be charged when you first make the transaction, with the merchant being TheTrainline, or whatever ticket agent you used.